He’s here and he’s perfect!!! You guys, I have a son! I am so grateful to be able to share this little angel with all of you. And when I say angel, I MEAN it. He has been such a good baby to far. Super tough, barely cries and so far sleeps a ton! And I am so excited to share his name with you guys today. Welcome Riley Doran Manno to the world! It’s crazy because the last two months of my pregnancy, we kept going back and forth between Henry and Miles. I had suggested Riley (and kept it on my top 5 list) a few months back but Kevin wasn’t taking to it like I was. So I had kind of dismissed it since Kevin wasn’t feeling it. But after our little guy was born he just didn’t look like a Henry or Miles to us. And after Kevin sat with him for a bit while I was recovering, he looked up at me and said “I think he’s a Riley.” I was so shocked to hear him say that but thrilled because I felt the same way! We struggled settling on a name that felt right for months and so many people told me that you know once you see the baby. That really proved true for us. I think the reason Riley felt so right to us is because we were able to bring our family into the name. Riley is kind of a tribute to our siblings. Really his entire name is a tribute to all three of our siblings. Riley (Ry for short) is honoring Kevin’s brother Ryan and my sister Raya (pronounced Rye-yuh) And Doran is my brother Michael’s middle name and my mom’s grandmother’s last name. So as you can see, little Riley Doran’s name is very special to us! Our daughter Molly Sullivan Manno is named after my grandmother Molly and Kevin‘s grandmother Eva Sullivan. And once we came up with that name we knew that we would never regret it because of the family meaning behind it. And that’s how we feel about Riley. The name we’re proud of and we know that he’ll be proud of too. As many of you know already, I was in labor for 22-hours. Longer than my labor with Molly! Which is unusual for a second child. I’m going to do a blog post in the future about my birth story, but for now I just wanted to tell you guys the name and thank you all for all of your love and support through this whole process! I feel like Riley has thousands of aunts and uncles all over the world in all of you! Thank you for loving us, thank you for loving Molly and thank you for loving him! Here are a couple photos from our birth experience! Thank you to our dear friend Ashley Burns for rushing over to the hospital in the middle of the night on a moments notice to capture photos of this special time in our lives. We love you Ash!!!! Congratulations!! Love the name and he’s such a cutie!!! I wanna say congratulations on the healthy baby boy. Welcome to the world Riley Doran you are already been loved since day one and we are so grateful to share your moms pregnancy with us. We all love and adore you and your big sister Molly. You both are a wonderful precious gift from God i hope life brings you all joy and many blessings and happiness in a lifetime. Thank you for letting us see and experience your pregnancy with us. We all love you Ali & Kevin & Molly & Riley & Owen. May God Bless you all with wonderful kind hearted memories. Take care of each other lots of love 😘 🤗. So sweet. What a precious name. Congrats on your beautiful family. Enjoy. Hugs and loves. Congratulations!!! He is beautiful and happy to hear Mama and Baby are healthy! 💙 his name!!! Perfect name for a perfect boy! So happy for you. Congratulations! He’s perfect. And so is his name! Love that there is so much meaning there. Sending lots of love to your family! Perfect name!! Thank you for sharing with us and letting us all feel apart of it. Your posts always make my day brighter and I look forward to them! He is perfect and precious and I love his name! Congratulations to all of you! Now for all the fun times with a little girl and little boy! Mine were 16 months apart and there were so many special moments. Enjoy every day with them! I have been following your insta to find out the name and I LOVE IT!! Congrats! Ali! His name is beautiful. Congratulations to you and yours. Welcome to the world Riley Doran! Congrats Ali, good work 🙂 He and Molly really do look alike! Can’t wait to hear your labor story. Congratulations!! What a beautiful little baby! Congratulations! He is beautiful and I am thrilled for you all. Riley is a great name! Boys are so sweet. I have a daughter first and a little boy 7 months ago! I love it!! Enjoy these sweet newborn days. Congrats to you, Kevin & Molly! He is perfect! Beautiful name, beautiful meaning and beautiful family! I have a feeling Molly is going to be the best big sister ever💓💓 Congratulations and much love to you and your perfect family!!! Congrats, Ali! He is beautiful! You are blessed! Congratulations! He is PERFECTION! How wonderful is it that he is so loved. My God truly bless you! I know Molly loves him so!!! Congrats Ali on Riley! Hope you are feeling good and that Molly loves her new brother! Congratulations, those are awesome names. My two neices are named Riley and Molly! So happy for you! Congratulations that’s a beautiful name!! Congratulations to you, Kevin and Molly!! 💙 I was always checking Instagram and insta stories for an update when you went in the hospital!! Curious to know how Molly is with her new baby brother? Is she obsessed with him or does she barely know he is around? Ha! So happy for you and your family!! Nothing brings more joy than a new baby!!! Congrats again!! I love the name and more important the meaning behind it. He’s a replica of Molly. Happy to see you both happy & healthy. Million dollar family! 💙💕 al the best to you all they are are fun! Congratulations! He is just perfect! Love his name and can’t wait to see him with Molly! Also, Uncle Ryan’s post on Instagram brought tears to my eyes… so sweet!! What a precious little sweetheart! Congratulations to your family. I hope you have a speedy recovery. He’s a cutie!! Love the name selection and the meaning behind it. I love when names honor the family in some way. My daughter weighed 8lbs11oz when she was born too. She was three weeks early. Thank god she decided to make her appearance early! Blessings to your family of 4! What a wonderful name! I also had my baby at Cedars-Sinai it was a wonderful experience! God bless you and your beautiful family! What a perfect name for a perfect little boy! So happy for you and excited for your cute and sweet little family!! Always loved the name Riley, but I married a man with the last name Riley so that wouldn’t work for us. However we have similar taste in names because my son is OWEN Riley! Another beautiful blessing for your family. Congratulations! I love how he is sucking his thumb in the first picture of your blog. So precious💙 You look great as always, Ali. Congratulations!!!! He is beautiful just like your family!!!! Enjoy!!! I love love love his name! Congratulations to your family. I’m over the moon excited for you all! Thank You for sharing. We love you! Congratulations on your beautiful baby boy! Can I please share with you that I honestly thought you guys would name him Miles. When you were asking for help with names my immediate thought was Miles! Crazy how it was your top name! But I do love the name Riley and it fits perfectly! He will be so loved and can’t wait to see more pics! Congrats!!!! Today is my Birthday too!!!! Congratulations! He is a special boy! Love the name! It’s true you will know when you meet them! Can’t wait to watch him turn into a little man, and develop like Molly has! Congratulations! Man he does look just like Molly! So adorable! All 5 of my kids have family names as well and it makes them all that more special! Love that you guys do that too! Oh how perfect!!! He’s adorable! Good job, Mana! Congratulations Ali and family! I was thinking about you all day when you were in labor! I look forward to hearing your birth story. And as another mama who also had a PPH and am currently pregnant, I am super interested in hearing what they may have done for you to prevent it again. I love names with meaning. My little girl is named after her great great great grandmas! Eliza Robbie Green Friedermann and my son is a jr! Congratulations and welcome to the world Riley Doran. You are now part of a loving family and have a great big sister Molly. Such a cutie and love the name Riley. Molly is going to be a great big sister. Wonderful family. Congratulations!!! He is beautiful and love his name !! Thanks for sharing this with all your fans! My oldest son is Riley. I love the name!! His name is PERFECT! He is perfect! My kids middle names both are named after family! I love carrying on family names ❤️. Congratulations ! Congratulations and Welcome to the world Riley Doran! I’m so happy for you guys and Molly and look forward to watching him grow up as we have with Molly. I love his name by the way! So precious! My daughter’s name is Rya, pronounced like your sister. Riley is a great name! Congratulations!! Thank you for sharing with all of us! I love the name and I hope you’re feeling well. Congratulations! He is so handsome and you’re one strong Momma! Riley and Molly really do look like twins. So happy for your beautiful family and praying for your recovery! Love the name!!! My middle daughter’s name is Rylea (pronounced Riley). I love the name for a boy or girl!! Congratulations!!!!! Love the name and can not wait to see pictures of Molly and Riley together!!!!! Congratulations 🎉 I actually prayed for you and your family before I went to bed. I felt for you being in labor for so long. I’m thankful that he arrived safely. I’m very happy for your family. That’s my sons name! We love it! More importantly he loves his name too. When we had our daughter it wasn’t as easy it took me 5 days to name her. I was stuck between 2 names. We got to know her personality and we found the name that fit her perfectly. This truly brought tears to my eyes. So happy for you all!! You are such amazing parents and I can’t wait to hear how Molly takes to her new brother! <3 From Auntie Lindsey in Pennsylvania! Ha! God Bless! Thanks for sharing the meaning behind his name. My beautiful 10 year old niece has the name Riley and it fits her perfectly too! He is so precious! Enjoy your babies, they grow up so fast! Oh and my Riley’s middle name is Inez which was her great-grandmother’s given birth name before it was changed when she was adopted. They thought she needed a fresh start but she always thought about her birth name. Congratulations Manno Family!! Riley is perfect!! Love the name!! Congrats to big sister Molly!! You are a wonderful family and so happy you’re okay after such a long labor!! Congratulations, Ali!! I’m so happy for you!! He’s beautiful!! Like so many people, I have been waiting eagerly to see him. I watch your insta-stories every day and I was there when you announced that you were pregnant with him and I’ve been on the journey with you the whole time, as well as being there for Molly’s first birthday and even before that. So it has been a very exciting time for me too and I’m glad he’s here, and I can’t wait to see more adorable photos of him and all four of you together. Once again, Congratulations!!! Congratulation Ali, Kevin, Molly, and Owen!! Riley is absolutely precious and so beautiful! Having a boy is SO much fun! There is nothing like the bond between mother and son! Enjoy him and watching his relationship with Molly. Siblings are the best! So happy for you!! I have a Riley too! He Is everything. I love the name! Congratulations! Congrats to you, big sis Molly, big brother (times 2) Owen and Kevin! I’ve watched you since you were on the bachelorette and I’m so happy you’ve found your forever happiness!!! Riley is absolutely precious! Much love to the whole fam! Congratulations! And baby Riley makes four. Congratulations you guys!! I love the name I must share that my daughter is Rylynn and we call her Ry for short! Riley was a huge choice for us but Lynn is a family name so we went with Rylynn. We are welcoming a baby boy in just a few short weeks so I love following you! He’s just precious! I LOVE his name, my sons name is Riley too😉So happy for you and your family. He is beautiful! Congrats! Love the name, but I’m a bit biased since that’s my daughter’s name. Welcome to the world, beautiful angel. A beautiful baby, and a beautiful family filled with love! I’m loving the name Riley! Such a cute name. How do you pronounce Doran. Is it like Door-Ann or Door-In? Congrats to you and your family! Now it’s a family of 5! Congratulations Ali and Family!!! He is perfect and love his name!! We have a daughter named Molly and a son named Henry.. so funny that Henry was on your list! The name is brilliant! I love it!!! Wishing you a quick recovery and sleep! Molly will be an amazing sister and helper. Love the meaning behind his name! My kids both have family inspired names too. It’s a special gift to share with them. Congratulations!! Congrats to you all!!!! He is beautiful!!! What a perfect name!!!!! 22 hours! Wow wee!!! Good job momma!!!! Congrats!! He is a beautiful baby boy!!! And what an adorable name!! I’m sure Molly is going to love being a big sister!! Congratulations!!! He is so precious 💙 there is something so special about the bond between a mother and son. Enjoy every minute of it! Congratulations on your sweet baby boy, Riley! Love the name you chose and that it has so much family meaning to it. God bless your sweet little family on your journey of life. May God bless you as you heal and may that sweet baby boy stay healthy and strong! love the name! congrats to you and your family 💛 how is molly adjusting? Such a beautiful baby boy. Congratulations. My dad’s name was Riley. Where I got my name as a baby girl, Rilyne. Congratulations Ali, Kevin, Molly and of course Owen (the dog). I love your son’s name. Riley is a perfect name for him. I was named after my dad (whose name is Eugene) and my aunt Sue (first name is Rebecca). My mom wanted a famine name for my sister and I. My middle name is Jean and my sister’s Is Jeannette. Congrats. again. Congrats! He is absolutely precious. I love all of those names! Henry was an option for our son, Miles is our pup and Riley is my daughter’s middle name! My twin boys are Henry and Miles 😀 congratulations! He’s adorable. Oh my gosh he’s adorable !! Already sucking his thumb !! Congrats to both of you !! Molly is gonna love her little brother it might take some time to but she will adore him . Them 2 pics are so similar OMG yikes there’s a gene there For sure 😁 . WELL I hope when you get home he continues to sleep a ton !! Looking forward for more pics. What a beautiful baby boy, Ali ! 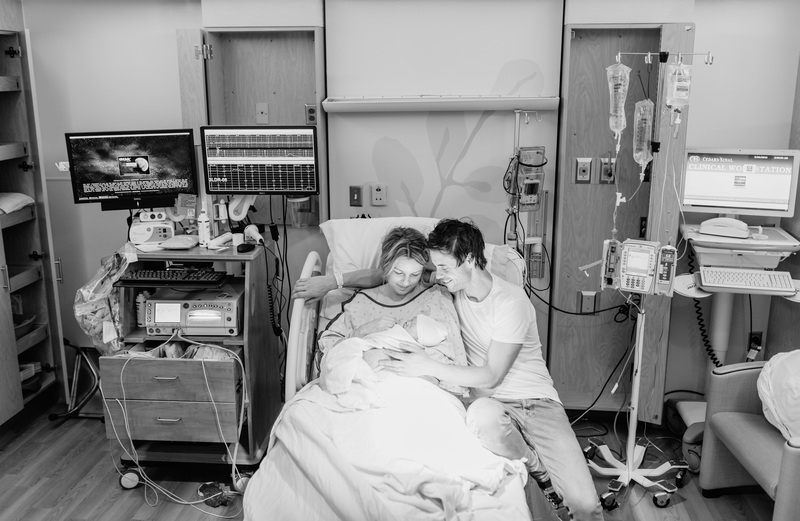 Congratulations to you and Kevin for welcoming little Riley into the world. You two are already amazing parents and you’ll only get better with two! Sending lots of love your way! Congrats!!! I love his name and he is just precious! I prayed for you that night! I’m so happy that everything went well and you have such a precious gift to come home with. I love his name and that he has a piece of his family to carry with him forever. Both of my boys have grandpa and dad’s names in theirs. Congratulations! You guys really knocked it out of the park naming both babies! Congrats guys. Congratulations!! He’s so precious and I love his name and the meaning behind it. That is so special! Aww he is so sweet! He and Molly will be the best of friends. One question though, did Ryan ugly cry when you guys told him Ryley’s name? Haha I know he is such a sweet guy that is very in touch with his emotions, so I can only imagine his reaction. Yay!!! Congratulations! Love the meaning behind their names. Molly and Riley just sounds great together too! So excited and happy for you!!! CONGRATS!!! I was checking Instagram like a mad woman to get an update about you. I had a 66 hour labor (prodromal labor for two days with contractions every three minutes), and I could see the discouragement when Kevin updated us. I felt that discouragement with my daughter as well. Long labors are hard to say the least! Even though my labor was long, I still look back of the magic of it in a positive light because it’s so incredible and I can tell that’s how you are with your new little love. So happy for you guys! Love the sweet name. Hi Ali, first, I want to say Congrats to your family of four.. Riley Doran is a perfect name and I love it… when my son was born I had two names picked out but didn’t go with either one. I waited until he was here and named him something completely different. Enjoy your family because they Grow up so fast. Again congrats!!!! All my babies are named after family members. It’s such a special gift to give family. Congratulations! Congratulations! He is so perfect! A little 😇 angel! We knew we were having a boy and had picked the name early in the pregnancy. In labor and driving to the hospital my husband says he doesn’t really like the middle name…hahah…I was like “are you kidding me?” But, he suggested his grand fathers name and it just sounded perfect! When you know, you know! 💙💙 congratulations to your little family!! Congratulations Ali, Kevin, Molly & Owen & welcome to the world Riley Doran!! Congratulations to you all! What a great blessing. Ali all the best to you, you are such a carefree Amazing woman. What a beautiful and precious family. Congrats to you and your loved ones. 17 hours seems long for labor these days especially since they knew he was so big. My younger son was that big pushing out one that size isn’t easy. You go girl. God Bless you and your little ones. Kevin too. Special names Molly and Riley is a strong name. Congrats to you all and good job momma!! Love his name and the meaning behind it! We did the same with our son too. I was in labor for 23hrs with him and pushed for 3 before finally have a csection!! We chose our sons name because it contained letters from all of his sisters and his middle name a combo of my husbands middle name, my dads name and my brothers name! Those are great stories to tell them in the future about how you chose their name! Congratulations on Riley. You have a beautiful family. Enjoy those kids, they grow way too fast. Congrats on your beautiful new baby boy! I love Riley’s names and the family connection. We did the same for middle names and our oldest’s middle name is my maiden name (my dad’s was his mom’s). Congratulation Ali, Kevin and Molly, baby Riley is so adorable!! Beautiful baby and name! Congratulations!! I already see a resemblance to Molly in his sweet little face. Hope your recovery goes smoothly!! Congratulations Ali!! Riley is adorable and he completes your sweet family! Thank you for always sharing your stories with us! Congratulations mama! So excited for your family. Our kids are similar ages! My daughter Millie turned 2 in April and William was born in March! I’m sorry induction was so long! Been there done that! Your hospital pictures are beautiful! FYI the first month with two is pretty terrible but it gets easier! William is almost 3 months now and things are finally in a good flow. Congratulations! I haven’t heard your birth story but I already feel like I can relate so so much!! Riley is a wonderful and strong name and your baby boy looks beautiful. Can’t wait to read about all your adventures and life changes with baby number 2. It will help me decide on my own baby number 2 :). I hope you recover quickly and enjoy all the time in the world with your adorable family 😍!! We were the same with our daughter! We had two names chosen, and neither suited her when she was born, so I spent the night staring at her and my husband suggested a name and I was like yes, yes Absolutely! Congratulations! Your little family is complete with a boy and girl. Such beautiful blessings you have! Congratulations on your precious baby Riley! I love your name choice, and I love that it represents your family. Your family is beautiful! Thank you for always sharing with us! He is absolutely Perfect! What fun you will have raising a son, along with your daughter. The perfect little family. He is gorgeous! I hope Molly is nice to him and doesn’t treat him like her Dolly’s. Lol!!! Just kidding. I’m sure she is in total love with him. Cheers to sleep filled nights and a low attitude change for Miss Molly. ( she might get naughty because of the new baby’s attention). Don’t be suprised if that happens. I hope you heal quickly Ali. I’m so happy for you. Congratulations! He is just gorgeous! Looking forward to reading about the birth story. Soak up every moment of this special time. He’s perfect! Congrats! The Mesnicks will be happy too as you have a Molly and Riley just like them. Too cute! Best wishes to you all! Congratulations, he’s adorable!! And I especially LOVE his name since our daughter’s name is Ryleigh!!! That name has always been my favorite. Enjoy this time with Molly and Riley!! And love the name since it’s also my daughters name Riley Sophia!! Enjoy the baby stage as you know they grow up way too fast. Congratulations!! Love the name especially when it has a meaning behind it. Beautiful baby! Beautiful family! Thanks so much for making time to share! Love y’all! Congratulations!! He’s perfect! And I love the name, my little girl is a Ryleigh also. Congratulation!! Your little guy is such a cutie!! And WOW look how beautiful you look!! I love your PJ’s. I love reading your blog and watching your videos. You seem so so down to earth and sweet, feels like I’m listening to an old friend. Best wishes to you and your family and again congrats on your new addition!! Congratulations!! Love the name! He is beautiful! Kind of crazy bc Jason’s wife is molly and their daughter is Riley. Always thought of Riley as a girls name. Welcome to the world precious Riley. You are loved beyond measure…. Our baby girl is going to be Riley in August! Congrats! Congrats! This is just too crazy to me, I’ve been following your pregnancy this whole time and I feel like we were within a few days of the same due date (I’m due May 30 – just a few more days! ), and I’m having a little girl and have been planning on naming her Rylee since we found out her gender. What a universe! Congrats to you, Kevin, Molly and Owen. I love the name and the meaning behind it. I think he will appreciate it in the long run. Thank you for sharing photos and your story. I love reading your blogs! Omg! First of all I hope you get to see my reply. I’m all the way out 189 replies. Ha! And probably by the time I get down with my post I’ll probably be in the 200,s! Ha! I am so excited for all of you! I love the name that you have chosen. And knowing the meaning of his name means so much as does Molly’s that when their old enough to understand the meaning of why they were named the name you gave them will mean so much to both of them. It’s such a nice way of remembering our loved ones. And knowing that they will be asking so many questions of why you named them after them gives you so many stories that you will enjoy telling them as they listen and they imagine of what they were like, as I did when I use to sit and listen to stories that my mom had told me of loved ones that has passed or even pass stories of when she was growing up. I had loved to listen to her and now I’ve pass the stories down to Jason, cause that’s how we keep their spirit alive on laughing and remembering them from the past. And we all do have so much love to give and to share that when you think how can I love somebody else as much as I love Molly,but you can and it’s natural there’s no change, just that your given more love to share. 🤗 😘 kisses to Jolly Molly & Riley! And of course Owen Wags! 🐕 and congrats to the Dad! Ps. And as we moms like to do after the birth of our baby is to smell their pure little heads. Welcome to world, Riley! He is so precious! Perfect name for a perfect little guy. cant wait to see pictures of him with his sister and brother(owen). Congratulations again Manno family!!! Love the name Riley. Perfect. He is adorable. Congratulations Ali and Kevin. Such a perfect little family. Aww I love the name Riley! He’s such a cutie and I see what you mean about the likeness to little Mollie! 22hours is intense but you look great Ali, I don’t know how you do it! Wishing you and your family lots of happiness! Congratulations to the Manno family. And welcome to the world Riley. Love the name and the special meaning. Totally couldnt tell the difference between Molly and Riley as newborns!! I hope Molly is adjusting to her baby brother well. So sorry you endured such a long labor. That little man was so comfy in your tummy he just wanted to cook a little longer!!! CONGRATS on the birth of your beautiful baby boy! I love that you connected both your children names to a tribute to your family! That’s is so rare now a days! Enjoy this precious time with your beautiful family ! Congrats again !! Congrats Ali!! He is beautiful and the name is wonderful!! Congratulations, he is perfect. My niece is named Ryleigh and her sister is Winter. He is absolutely precious!!!Congratulations!! Love his name!! Welcome to the World Riley!!! Congratulations to you both. Riley is an adorable name. He does look just like Molly. That’s how we were with our last child we had! We had two names as well! And once we saw him we knew! He is named after his Great Great Great grandpa on my side and grandpa on my husbands side! Asher Holden-Dewayne! Congratulations he is absolutely Beautiful!! Congratulations!!! My son’s name is Riley. Finally, I now know another BOY named Riley, I mean I don’t know you personally, but I feel like I do since I have been watching you and your journey since the bachelorette days…..Again congratulations to you and your family, it is a beautiful journey to watch! Oh what a beautiful son! I love the name. It fits! So proud of you and Kevin. What a beautiful family you have. I cried looking at the photos. It was happy tears and seeing how happy you and Kevin were was captured in the photos. Praying for you all. Your wonderful Ali and thank you for being real! It seriously made me cry when you said that you feel like Molly and Riley have aunts and uncles all over the world. I watched you on the bachelor/bachelorette and watch you on TV/instagram and I listen to Kevin and the team every morning on my way to work. You truly feel apart of our family. I’ve prayed for you all and truly hope and wish the best for you all and your sweet little ones! Love his name! My daughter’s middle name is Doran too! My grandmother’s last name was Doran as well. How special!!!!! Love it! Congratulations!!! What a beautiful and meaningful name. God Bless!!! He’s absolutely adorable and I love the name Riley for a boy! Our twin girls names are Ryleigh and Rosa. 😊 Congratulations!! You have a beautiful family. Congratulations Ali and Kevin ang big sister Molly!! Riley is precious! Congradulations. Beautiful baby boy for a beautiful family. Congratulations!!! I love how you picked his name and the meaning behind both Riley and Molly’s names. You have such a beautiful family, life, and heart. Thank you for sharing with us! Congrats honey. He’s such a cutie and Riley is a perfect name for him. Love reading your blog. Congratulations! Welcome to the world Riley Doran! Beautiful name! Ali, Baby Riley is Presious 💕. I love how you and Kevin really took your love and respect to your families names into account for both your children. Yes, one day the kids will look back and see how important they are to the two of you. God Bless Baby Riley 💙. My daughter’s name is Riley! Love his name! Congrats you have a beautiful family!!! These are just so sweet and wonderful. What a cute little guy! I love your idea of having cozy pjs to wear in the hospital to make YOU feel more at ease too. I’m going to scoop these up before the nordies sale ends. Did you get your normal size? Congrats again sweet lady! I’m a little late to the game but we named our son Riley too! (Born early 2017). Absolutely love it! I love hearing about other boy Riley’s!! !